The day after making this cake, I forced myself to cut what was left into slices, wrap them individually and hide them in the back of the freezer. At which point I promptly pulled one slice back out of the freezer and ate it. This whole clementine cake is a classic Sicilian recipe, which I learned about by way of the incredible Nigella Lawson. 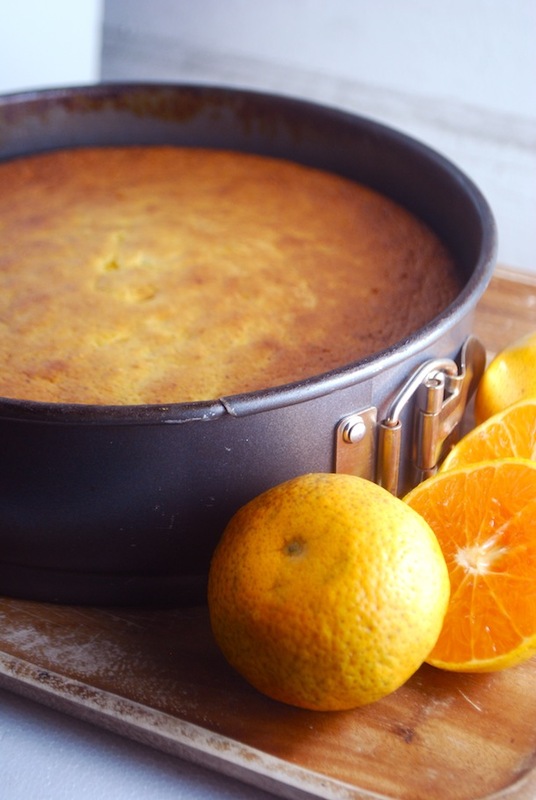 Much like my whole orange bundt cake, this cake is made using whole clementines that have been boiled until tender and slumpy, then pureed into a smooth, intoxicatingly flavored paste. Eggs, ground almonds, baking powder, and (in the original) sugar are added, then the whole thing bakes up into a moist, slightly spongy, and incredibly fragrant cake. Apart from the sugar swap, I also played with the recipe by adding a touch of kosher salt and a couple teaspoons of almond extract to play against the bitterness of the clementines. While the cake baked, the aroma of citrus and almonds wafted out of the oven and filled our apartment like some kind of delicious, intoxicating room perfume. I spent the last few minutes of baking time dancing around in front of the oven as I impatiently waited for the timer to buzz. Spongy, not-too-sweet, and just a touch bitter in the absolute most perfect way possible. Eugene tasted it and pronounced it "a very sophisticated cake." This is a lovely everyday cake, best eaten straight out of hand while cuddled on the couch with a mug of something hot. And it is a stunning cake to serve company--particularly if you know your guests prefer subtle sweets. I think it would also be a perfectly acceptable breakfast cake. As it contains no flour, it is also a lovely gluten-free cake recipe. If you're not watching your sugar, you can of course stick to the original recipe; I share both options below. Place the clementines in a pot and cover with water. Bring to a boil and let simmer 1 1/2 hours, until very tender. Remove from water, then chop and remove seeds. Add the remaining boiled clementine (everything but the pits) to a food processor or blender and puree until smooth. In a mixer with a whisk attachment, beat the eggs for 5 minutes until very light and frothy. Add the sweetener or sugar, clementine puree, ground almonds, almond extract, salt, and baking powder and beat again for 5 more minutes until very light. Pour into the prepared baking pan and bake 50 minutes to 1 hour or until set. Let cool in the pan, then unmold and serve. I sprinkled it with some powdered sugar before serving, but it's also lovely plain.